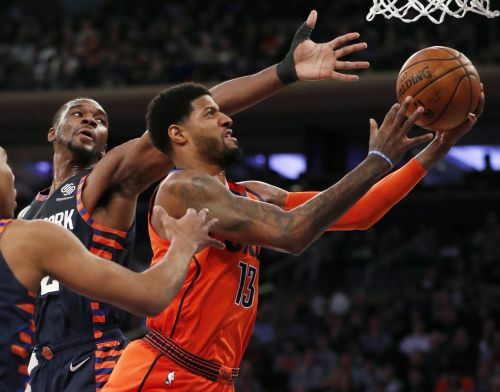 NEW YORK (AP) — Paul George, Russell Westbrook and the Oklahoma City Thunder put this game away in a hurry. "We went out with a 20-point lead and our second unit came in and did the same thing," George said. "At that point, game is over." "It's the one-quarter woes," Hardaway said. "We have to come out more aggressive. You just have to keep looking ahead. You can't take any of these seconds, minutes or hours back." New York got within 15 before Westbrook's three-point play gave Oklahoma City a 61-37 lead with 2:21 left in the second quarter. "We did a good job," Thunder coach Billy Donovan said. "One of the things that helped is we shot really well from beyond the 3-point line in the first half, and really the whole game." "It's a blessing to be able to play on Martin Luther King Day," Westbrook said. "The things he's done for guys like myself and guys in this locker room to be able to go out and play, to walk around freely and do things in the world is exceptional." The Knicks haven't won at home since a 136-134 overtime victory against the Bucks on Dec. 1. New York is now 4-14 at MSG.